The Energy Queensland Group is 100% owned by Queenslanders. As a Government Owned Corporation, we deliver electricity across Queensland through our ‘poles and wires’ businesses Energex and Ergon Energy Network. 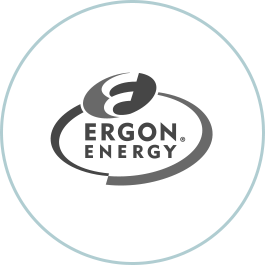 Our retailer, Ergon Energy Retail sells this electricity to customers throughout regional Queensland. These essential service activities are also supported by a range of innovative products and services delivered through our Yurika and other market brands. The Group, formed in June 2016, energises Queensland communities from Tweed River to Torres Strait and from Brisbane across to Birdsville. Image provides an illustration of the Energy Queensland brands. Connection and supply of electricity to 2.3 million customers across Queensland. Sale of electricity to 700,000 retail customers in regional Queensland. Provision of valued, innovative products and services to customers. We have a unifying Vision, Purpose and set of Values that guide everything we do at Energy Queensland. Our Vision helps us to understand where we’re heading, our Purpose is what we do (our core role), and our Values are how we do it. Vision: Energy Queensland’s vision is to energise Queensland communities. Purpose: Everything we do is driven by our purpose to safely deliver secure, affordable and sustainable energy solutions with our communities and customers. Image shows our strategic objectives which are led by a community and customer focus. We are committed to delivering for our communities, and the customers within them, by operating safely as an efficient and effective organisation, creating value through innovation and strengthening and growing from our core business.